The great barn at Place Farm in Tisbury, along with the gatehouse and other medieval buildings was part of a grange belonging to Shaftesbury Abbey. It is thirteen bays long with a central midstrey and wagon porch facing a smaller wagon porch opposite. The barn has cruck trusses connected by two collars and curved yokes, supporting a thatched roof. The Fonthill Estate has made a tremendous job of cleaning and restoring the barn. It has now been converted into a beautiful art space for Messums of London. 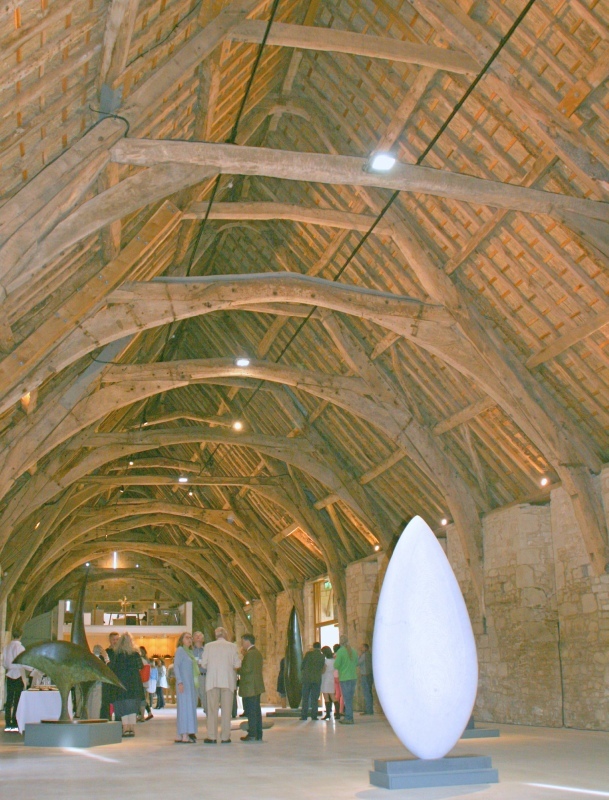 Now known as “Messums Wiltshire”, their website carries a history and more photographs of the barn. The effect inside is tremendous. New lighting has been installed and an office mezzanine with a shop below inserted at one end. The rest of the huge barn is a great open space to display the sculptures.